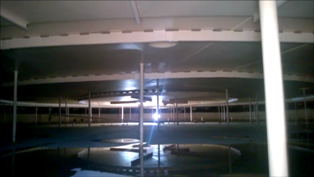 Following the errors occurred during the erection and continued exploitation, the membrane of single deck floating roof has been deformed. One part of the water does not reach roof drain, leaves on the roof and accelerates corrosion process. The installation of additional stiffening girders approximates the shape (the slope) of the membrane toward the projected one. These girders stabilize the roof in the case of wind blows and suction. 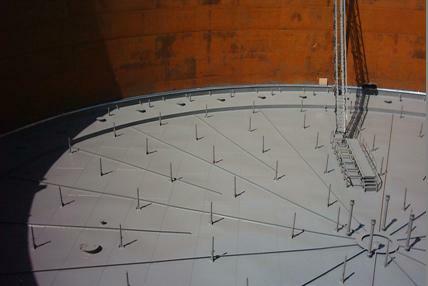 When the tank has the diameter D > 40 m the classical single deck floating roofs without any stiffening on the membrane is not recommended solution, because during the exploitation big deformations will appear in the membrane. Serious deviations from the projected form of the membrane are possible especially if they are situated in the area with increased wind speed or membrane is made by rolls method. - when the girders have big stiffness and their joints are rigid the work of the central part of the roof is changed. It is not the round hanging membrane any more and becomes round orthotropic plate. The complementary stiffening probably could be necessary if the girders and pontoons work together. - the radial girders on the roof can have different positions. Some possible solutions are shown on the figure bellow. - girders which are not connected and are dislocated between them - the girders stabilizing the membrane have the length = 0,25.Dr. Due to this construction roof becomes more stiff, but works as a hanging membrane. The forming of the independent sections above the membrane is impossible. Many tanks which volumes are V = 50 000 m3, which are stiffened with girders made as a rings, and the girders dimension are L100x100x110 mm, are constructed in Poland. When the measurements for determining the moving in the center of the membrane have been done this mode for stiffening showed very good effectiveness. - it is impossible to form smaller sectors on the membrane. When the radial and circular stiffening ribs are used the consumption of the metal and labor is bigger comparing with the other methods for membrane stiffening. Research of the influence of the girders upon the deformation of roof membrane. The author made 3D computer models of roof membrane and stiffening girders and after that he made science research and analysis. - the circular stiffening girders under the membrane decrease its deviation from loading but more material is used and the weld joints which must be done are on the ceiling.